UGI’s community efforts aim to improve educational opportunities and encourage the development of the many children throughout the communities we serve. UGI is pleased to support and partner with Big Brothers Big Sisters, our Featured Community Organization for January, in recognition of National Mentoring Month. UGI’s Bowl for Kids’ Sake bowling team in Wilkes-Barre. Big Brothers Big Sisters provides children with a strong, enduring, one-on-one relationship to help them achieve success in life and change their lives for the better. Through meaningful mentoring between adult volunteers and children, Big Brothers Big Sisters provides children facing adversity with supportive relationships to build confidence and better relationships, avoid risky behaviors, and achieve educational success. UGI volunteers participate in COUL Night in Reading. Throughout the year, UGI employees donate their time and energy to Big Brothers Big Sisters events and causes. 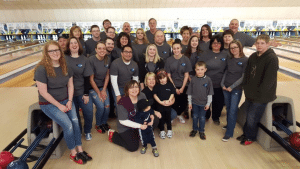 During Big Brothers Big Sisters’ signature fundraiser, Bowl For Kids’ Sake, UGI teams came together to raise money for the organization while enjoying a night out in the community. 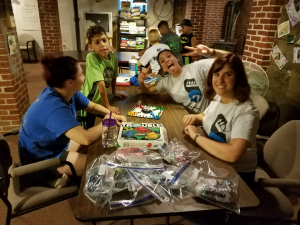 In the Reading area, UGI volunteers hosted a COUL (Club of Unmatched Littles) Night which included dinner and working on a tie-dye t-shirt activity. UGI is proud to participate in these activities, as well as the many other events Big Brothers Big Sisters hosts in our service territories. To learn more about Big Brothers Big Sisters and to locate a chapter in your area, visit www.bbbs.org.